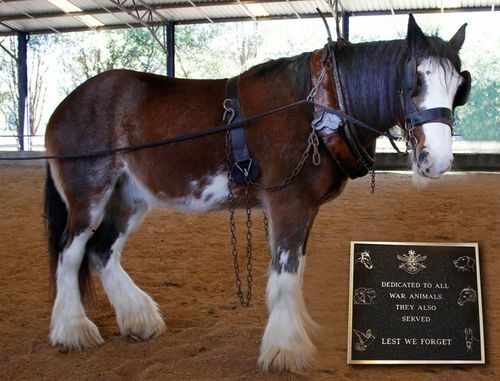 A plaque commemorates all the animals that have served Australia in war and peace and the sacrifice they have made in battlefields across the world . Senior Constable Nigel Allsopp, a current-serving police-dog handler and President of the Australian War Animal Memorial Organisation, was a driving force behind the war-animal memorial dedication. Riding for the Disabled Association Queensland approached the Australian War Animals Memorial Organisation (AWAMO) on the Centenary year of World War One to show their association with horses and Digger rehabilitation since that war. Many returned servicemen after World War One, especially those with amputations were taught to ride to aid balance. Today the tradition continues and Burpengary Riding for the Disabled is among the pioneers of providing lessons to return Afghanistan Veterans with physical and psychological illness. Amongst the guests at the unveiling ceremony was Brigadier Bilton the Commanding Officer of ADF 7th Brigade Brisbane. Nigel Allsopp the President of AWAMO opened the plaque presentation by donating $500 to the Riding Centre which will pay for five Australian Defence Force personnel’s Insurance and lessons for the next year. Brigadier Bilton will select the five soldiers to undergo the training. AWAMO also donated a further $500 to pay for volunteer Instructors tuition fees, which will allow them to qualify in a certificate too coach disabled riders. VIPs unveiling the plaque included the Local State MP, Brigadier Bilton and Mr Laurie Watts of the Light Horse Association. Over 125 disabled riders ranging from 6 to 60 use the centre which was visited by Her Royal Highness Princess Anne in 2014. Animals have played a very significant role in assisting our defence forces over the years and the memorial plaque is to show support for the many dogs, horses, mules, donkeys, camels and pigeons who have bravely served Australia. The recognition of animals in war is not new as three pigeons had been awarded the Dickin Medal - the equivalent of a Victoria Cross - in World War One and a British mine detection dog in Afghanistan has also received the same award.